President Trump in June in Miami, when he first announced his sweeping changes to America’s Cuba policy. 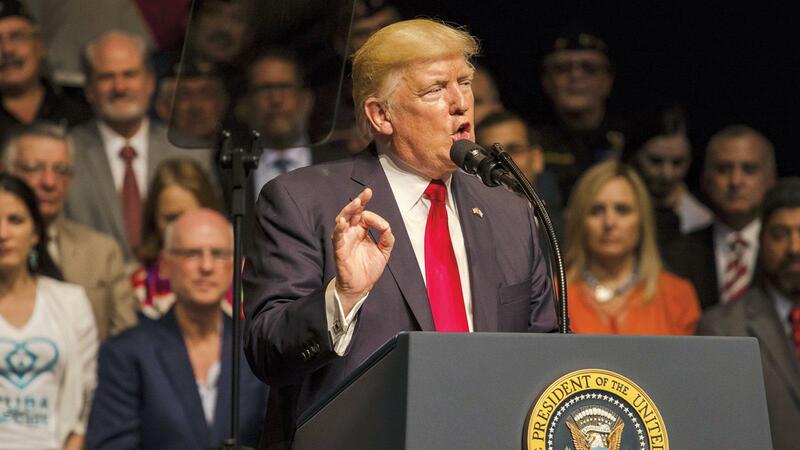 The Trump Administration today tightened restrictions on the ability of U.S. citizens to travel to Cuba and U.S. businesses to conduct commercial transactions with state-owned companies on the island. “We have strengthened our Cuba policies to channel economic activity away from the Cuban military and to encourage the government to move toward greater political and economic freedom for the Cuban people,” said Treasury Secretary Steven Mnuchin, in announcing the changes. The new regulations do not affect the ability for U.S. travelers to bring back Cuban cigars and certain kinds of rum, “as long as you fit into the revised travel categories,” a Treasury Department official informed reporters during a White House background briefing. Current regulations allow travelers to “return to the United States with alcohol and/or tobacco products acquired in Cuba as accompanied baggage for personal use,” according to an FAQ page posted on the Treasury Department website, as well as to purchase them in third-party countries and bring them back to the U.S., so long as they are not resold in the U.S. The new regulations, though, will restrict cigar aficionados from buying Cohibas, Romeo y Julietas, Montecristos and other famous tobacco brands in some of Cuba’s renowned cigar shops—among them the La Casa del Habano in the Conde de Villanueva Hotel, and the Cohiba Atmosphere Club in the luxurious new Gran Hotel Manzana Kempinski Hotel. Nor will they be able to smoke them while drinking mojitos made with Ron Varadero or Ron Caney rum at Ernest Hemingway’s favorite hangout in old Havana, the Hotel Ambos Mundos. As of November 9, when the Trump regulations go into effect, those hotels and more than 80 others across the island, along with those liquor brands, will be off-limits to U.S. travelers and businesses. This is because they appear on the new “Cuba Restricted List” of companies and agencies administered by the military-run Grupo de Administracion Empresarial S.A. [GAESA] corporation. Besides hotels, the “List of Entities and Subentities Associated with Cuba” names tourism companies, government offices, stores and other commercial agencies across the island with which U.S. travelers and business interests can no longer conduct any type of commercial or financial transaction, including renting rooms, eating and drinking, and purchasing products or services. The goals of the new regulations, officials said, were to enforce compliance with U.S. laws on the trade embargo and “statutory restrictions on tourism.” Indeed, the regulations effectively end the Obama-era effort to open engagement with Cuba by allowing U.S. citizens to designate themselves as “people-to-people” and “educational” travelers—two of the categories under which individuals could legally visit the island. Under Trump’s rules, however, “individual people-to-people nonacademic educational travel will no longer be authorized” and visitors must now travel with approved tour and education providers. In the face of strong criticism that terminating individual travel will hurt Cuban private sector entrepreneurs—Airbnb homeowners, private restaurateurs, taxi drivers, guides, among them—the Trump administration appeared to open the door to some individual travel under the “Support for the Cuban People” category. If such travelers engaged in full-time activities “that result in meaningful interaction with individuals in Cuba,” including renting rooms in private residences, eating at paladares, and shopping at privately owned stores, they could legally visit Cuba, according to the new regulations. But they also state that “in order to meet the requirement of a full-time schedule, a traveler must engage in additional authorized Support for the Cuban People activities”—a vague requirement likely to deter large numbers of individual U.S. citizens from taking this route to Cuba. The number of U.S. visitors to Cuba has already taken a hit from a strong “travel advisory” issued by the Trump administration in late September in response to health problems suffered by a small number of U.S. embassy personnel and several other visitors earlier this year. Advocates of free travel to Cuba predicted that the new uncertainty around what travelers can and cannot do in Cuba would further curtail the number of visitors to the island, severely hurting Cuba’s growing private sector which caters to their business. Despite the new obstacles, U.S. tour companies emphasized that it remained legal to travel to Cuba as well as advance business interests there. “There remain countless ways to legally visit the island,” according to Collin Laverty, president of Cuba Educational Travel, “and there are many fully compliant avenues for doing business” in Cuba.